We may encounter burning edge problem when using metal laser cutting machine in processing. Do you know why this occurs and how to solve it? Metal laser cutting machines generate a lot of heat when processing sheet metal. Under normal circumstances, the heat generated by cutting will spread along the slit into the processed sheet metal to be cooled. In the processing of the small hole of the metal laser cutting machine, the outside of the hole can be cooled, and the small hole portion inside the single hole is small in space due to heat diffusion, and the energy is too concentrated to cause overburning and drossing. In addition, in the slab cutting, the molten metal accumulated on the surface of the material and the accumulation of heat generated during the perforation may cause the auxiliary airflow to be disordered and the heat input to be excessive, thereby causing overburning. 1. Solution for over-burningproblem of metal laser cutting machine in the cutting of carbon steel holes: In the cutting of carbon steel with oxygen as the auxiliary gas, the key to solving the problem is how to prevent the heat of oxidation reaction. A method of assisting oxygen during perforation and switching to assist air or nitrogen for cutting may be employed. This method can process small holes in 1/6 thick plates. Pulse cutting conditions with low frequency and high peak output power have the feature of reducing heat output and contributing to optimization of cutting conditions. The condition is set to a single-pulse laser beam, a high peak output with high energy intensity, and a low frequency condition, which can reduce the accumulation of molten metal on the surface of the material during the perforation process and reduce the heat output. 2. 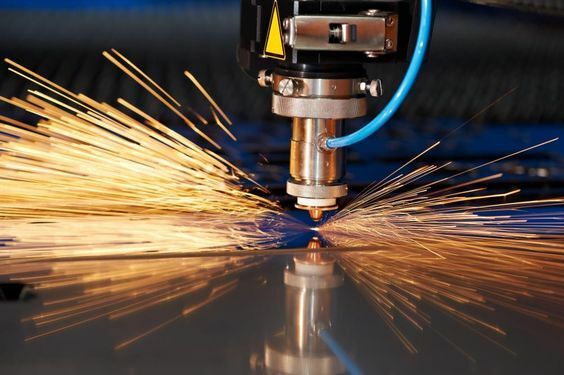 Solution of metal laser cutting machine in aluminum alloy and stainless steel cutting: In the processing of such materials, the auxiliary gas used is nitrogen, no burning edge occurs during cutting, but the temperature of the material inside the small hole very high, the internal slag phenomenon will be more frequent. The solution is to increase the pressure of the auxiliary gas and set the condition to a high peak output, low frequency pulse condition. The auxiliary gas uses air as well as when nitrogen is used. It does not burn too much, but it is easy to slag at the bottom. It is necessary to set the conditions to high auxiliary gas pressure, high peak output, and low frequency pulse conditions. What does the cutting accuracy of metal laser cutting machine depend on? As we all know, cutting accuracy is an important part of measuring the quality of laser cutting machine. In fact, the accuracy of metal laser cutting machine is not entirely determined by the equipment itself, but is composed of many factors. After analyzing the laser professional and technical personnel, we have the following major factors. We all know that the laser beam is tapered, and the resulting gap is also tapered. In this case, the thickness of 0.3MM stainless steel will be much smaller than that of 2MM. Under this conical laser beam, the greater the thickness of the workpiece is, the lower the accuracy will be, so the larger the slit is. When the conical laser beam is gathered together, the spot becomes smaller and smaller. Therefore, the accuracy of the laser cutting is also getting higher and higher, especially the width of the slit becomes smaller and smaller. According to our laser professional and technical personnel, at this time, the smallest spot can reach 0.01mm. This is also one of the factors that affect the cutting accuracy of laser cutting machine. Whether it is a simple workbench or a high precision worktable, it will affect the effect of laser cutting. The cutting accuracy of laser cutting machine is slightly different for different materials. Even if the same material is used, the accuracy of cutting will vary if the composition of the material is different. Therefore, the material of workpiece has certain effect on the accuracy of laser cutting. If you are interested in our laser cutters, please click on our website. There are various models of laser engraving machines to choose from. When laser cutting sheet metal parts, a lot of heat will be generated, and the heat will not be spread in time. In the processing of small holes, the metal laser cutting machine can be cooled on the outside of the hole. The small hole on the inside of the single hole is small because the heat can be diffused. The heat is too concentrated to cause excessive burning and slag. In addition, in the thick plate cutting, the molten metal accumulated on the surface of the material and the accumulation of heat can make the auxiliary air flow disorder and heat input too much, thus causing excessive burning, causing the phenomenon of burning edge. So how to solve the problem of edge burning and slag hanging? The solution for overburning when laser cutting carbon steel for small hole cutting. In the cutting of carbon steel with oxygen as the auxiliary gas, the key to solve the problem lies in how to restrain the production of oxidation heat. The method of auxiliary oxygen or delayed switching can be used to cut auxiliary air or nitrogen. This method can process small holes whose upper limit is 1/6 thick plate. The pulse cutting condition of low frequency and high peak output power can reduce heat output and optimize cutting conditions. Setting the condition as a single pulse laser beam, high peak output and low frequency condition of high energy intensity can reduce the accumulation of molten metal on the surface of the material during the perforation and reduce the output of heat. 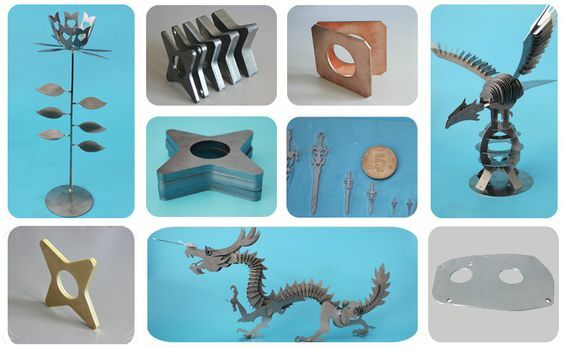 Solutions for laser cutting of aluminum alloy and stainless steel. The auxiliary gas used in the processing of such materials is nitrogen, which will not burn edges in cutting. However, due to the high temperature inside the small hole, the phenomenon of slag sticking in the inner side will be more frequent. The solution to this problem is to increase the pressure of auxiliary gas. The conditions are set as high peak output and low frequency pulse conditions. When auxiliary gas is used in air, it will not burn as much as when nitrogen is used. However, it is easy to appear slag at the bottom. It is necessary to set the conditions for high auxiliary gas pressure, high peak output and low frequency pulse conditions.